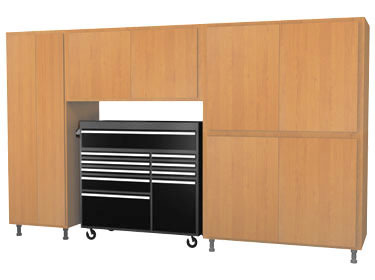 A 9x6 foot Garage Workstation - Cabinets and Tool Chest Storage. A lot of storage space to help organize your garage while also keeping your tool chest easily accessibly. This is a great standalone cabinet system for the weekend mechanic seeking extra storage and also makes a great addition to any of our other cabinet systems. For custom cabinet configurations or our current specials please contact us. Note: Tool Chest Sold Separately.